Photo measuring approx. 4.5 x 2.75 inches. This is another one of the ones my friend Nathan gave me. I’m guessing boys, father and grandfather, and I’m assuming the car belongs to at least one of them. 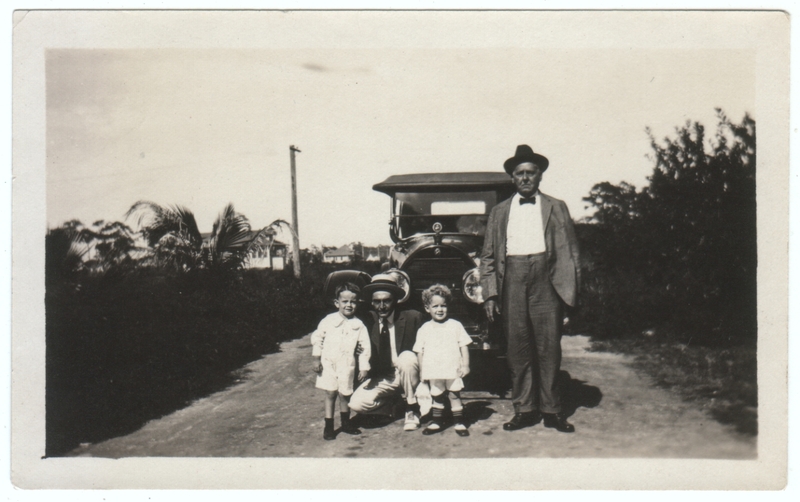 Grandpa looks like he isn’t terribly thrilled to be flying around suburban lanes in these machines, not to mention standing in the blazing sun while someone aims one of these camera contraptions at him, but everybody else seems to be having a good time. I think it’s 3 boys and one of them has really long legs. Grandpa certainly looks stiff. I love dad’s boater. Looks very 20s to me (I’m sure it does to you also.) but that is probably because I am obsessed with Boardwalk Empire at the moment and the car and hats seem to fit. Yes, I would have guessed around that time, too.